..the bamboo cane in which, at the time of the Byzantine Emperor Justinianus, two Persian friars who had long been in China to discover the secrets of sericulture had brought the first eggs of the silkworm over the Empire’s borders into the Western world. …a traveler approaching Norwich under the black sky of a winter night would be amazed by the glare over the city, caused by the light coming from the windows of the workshops, still busy at this late hour. It is difficult to imagine the depths of despair into which those can be driven who, even after the end of the working day, are engrossed in their intricate designs and who are pursued, into their dreams, by the feeling that they have got hold of the wrong thread. …silk brocades and watered tabinets, satins and satinettes, camblets and cheveretts, prunelles, callimancoes and florentines, diamantines and grenadines, blondines, bombazines, belle-isles and martiniques…That, at any rate, is what I think when I look at the marvellous strips of color in the pattern books, the edges and gaps filled with mysterious figures and symbols, that are kept in the small museum of Strangers Hall, which was once the town house of just such a family of silk weavers who had been exiled from France. It was with great surprise and pleasure, then, that I stumbled upon a reference to the wonderful blog Venetian Red, where there is an extensive and well-illustrated article by Christine Cariati on James Leman and Anna Maria Garthwaite, two 18th century silk weavers of Spitalfields, the section of East London, which had once been the textile center for the city. Like Sebald, Cariati carries the story of the English silk industry beyond its demise and into our time. 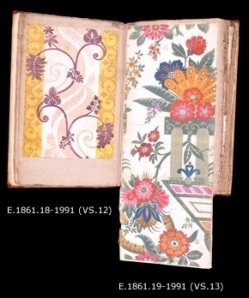 An interesting aside to the Huguenot story is that one of the most prominent Huguenot families to settle in England was the Courtaulds, who fled from France in the 1680s and later became silk weavers. A descendant of this family, Samuel Courtauld, who took control of the company in 1908 (the firm invented rayon, a synthetic silk, in 1910), achieved great renown as an art collector. In 1932 he founded the Courtauld Institute of Art in London, to which he bequeathed his collection upon his death in 1947. If you have never visited the galleries of the Courtauld in person, you may take a virtual tour at their website.